The history, properties, and uses of rubidium and cesium align very closely. The two heaviest nonradioactive alkali (group 1) metals are also the two most electropositive elements and are so reactive that they will ignite when they come into contact with air or water--a property that classifies rubidium and cesium as hazardous substances despite their minimal toxicity. Both are extremely soft and ductile solids, and while cesium is one of the few metals that is liquid at room temperature, rubidium remains a silvery-white solid up to its slightly higher melting point at 39.3 °C. Shortly after identifying cesium as a new element using flame spectroscopy in 1861, Robert Bunsen and Gustav Kirchhoff discovered rubidium in the same manner while examining the mineral lepidolite. The scientists named both elements after the vibrant color of lines in their emission spectra, and thus “rubidium” derives from rubidus, the Latin word for “dark red." The relative abundance of rubidium in the earth’s crust is higher than originally assessed; now considered to be the 16th most abundant element, rubidium is found in the minerals lepidolite (its primary commercial source), leucite, pollucite, carnallite, and zinnwaldite, in addition to some potassium minerals and brines. Natural rubidium is composed of one stable isotope (85Rb) and one radioactive isotope (87Rb) in a 72.2 to 27.8 ratio; because 87Rb decays to 87Sr with a half-life of 49 billion years (close to 3 times the estimated age of the universe), the mechanism serves as the basis for a rock and mineral dating method. Rubidium has a variety of medical applications, from using rubidium chloride as a biomarker to detecting brain tumors using radioactive 82Rb. Rubidium compounds are used in components of photoelectric cells and optical glass, as catalysts and “getters” in vacuum tubes, and as a source of the color purple in fireworks. Vaporized rubidium is often employed in laser cooling and Bose-Einstein condensation, as its spectral absorption range aligns with many commercially available laser diodes. Like cesium, rubidium is also used in highly accurate atomic clocks that form the standards for GPS and telecommunication networks. Rubidium has various applications in medicine and photo-electronics. Since it is easily vaporized, rubidium's spectral absorption range is a good target for laser manipulation of atoms. Rubidium is available as metal and in compound forms with purities from 99% to 99.999% (ACS grade to ultra-high purity). Rubidium oxide is available in forms including powders and dense pellets for such uses as optical coating and thin film applications. Oxides tend to be insoluble. Fluorides are another insoluble form for uses in which oxygen is undesirable such as metallurgy, chemical and physical vapor deposition and in some optical coatings. Rubidium is available in soluble forms including chlorides, nitrates and acetates. These compounds are also manufactured as solutions at specified stoichiometries. Rubidium is a Block S, Group 1, Period 5 element. The number of electrons in each of Rubidium's shells is 2, 8, 18, 8, 1 and its electronic configuration is [Kr] 5s1. The rubidium atom has a radius of 247.5.pm and a Van der Waals radius of 200.pm. Rubidium is highly reactive, with properties similar to other Group 1 elements, e.g., rapid oxidation in air. In its elemental form, CAS 7440-17-7, rubidium has a gray white appearance. Rubidium is found in the minerals lepidolite, leucite, pollucite, carnallite, and zinnwaldite as well as some potassium minerals. Rubidium was first discovered by Robert Bunsen and Gustav Kirchhoff in 1861. The name rubidium originates from the Latin word rubidus, which means dark or deepest red. Safety data for rubidium compounds can vary widely depending on the form. For potential hazard information, toxicity, and road, sea and air transportation limitations, such as DOT Hazard Class, DOT Number, EU Number, NFPA Health rating and RTECS Class, please see the specific material or compound referenced in the Products tab. The below information applies to elemental (metallic) Rubidium. Flammability (solid, gaseous) Contact with water liberates extremely flammable gases. 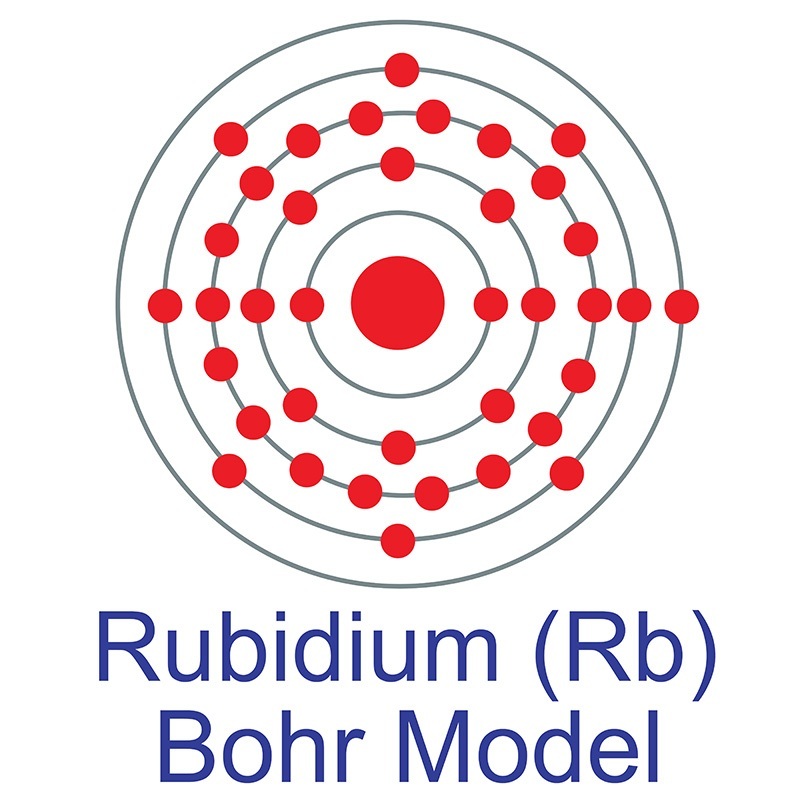 Rubidium (Rb) has 32 isotopes, two of which are naturally occurring: 85Rb (72.2%) and the radioactive 87Rb (27.8%).